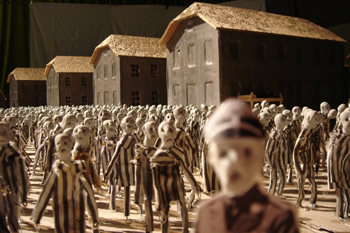 Pauline Kalker, a founder of the Dutch theater company Hotel Modern, never uses the word toy when referring to her company's work "Kamp," a 36-by-33 foot model of Auschwitz populated by 3,000 three-inch-tall figures. "The word is not in our vocabulary," said Ms. Kalker . . . "We are making a live action animation film onstage." Three grim adults crouch over a modified reconstruction of the concentration camp at Auschwitz-Birkenau. 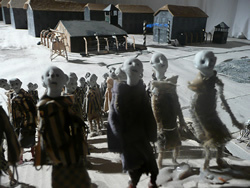 With a small camera, one of the three shoots scenes from the daily life of the camp, performed by simple figures. Sometimes the audience cannot directly see what the puppeteers are doing, and the minute size of the figures in any case makes it hard to see what transpires with much clarity. A projector makes scenes visible on a screen upstage. To most viewers, these scenes will be familiar, but they remain horrible, and viscerally so when, for instance, one puppet wielding a truncheon again and again strikes another puppet. Amplified sound accentuates the disturbing effect of this beating. In one sequence, Kamp focuses not on the victims themselves but on the possessions they have been forced to surrender. The poignancy of these objects is familiar -- the subject of a memorable sequence, for instance, in Schindler's List. Nevertheless, when the victims are themselves "performing objects," to use a phrase popularized by John Bell, objects stolen from them take on a different charge. In Kamp, the camera scans open suitcases: clothing, a pair of binoculars, a menorah. And toys: stuffed animals. How miniscule must that elephant be, to be a toy for a three-inch-tall "child"? The affective force of these objects conjures daily lives that ended with the arrival at the death camp. "Auschwitz." "Toy." Words from vocabularies that do not overlap. Just as there could be no toys in Auschwitz, so Auschwitz must not become a toy. To distance Kamp and its miniscule figures from toys -- and thereby to distance these performances from play -- is understandable. As became clear in the uproar around Zbigniew Libera's Lego concentration camp sets of 1996, to make a toy of the Holocaust is to risk accusations of obscenity. "The word is not in our vocabulary." And yet words not in vocabularies can be the words most needed. 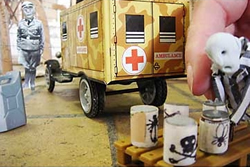 To call Kamp a performance using toys might seem to suggest that it trivializes Nazi genocide. However, to shut down the possibility that the puppets of Kamp might resemble toys eliminates a crucial framework for understanding the piece. While not so grave a risk as trivializing Auschwitz, there is also a risk in refusing to recognize play. Surely these three human performers, moving methodically and deliberately among the models, resemble nothing so much as serious children at play. When Herman Helle brings a train into the station the contrast is especially sharp: he both resembles an earnest boy with his toy train set and re-enacts one of the paradigmatic scenes of mechanized inhumanity. To pretend that we do not see the earnest boy would be to erase the serious play that seems to me what justifies the performance. This formulation of course invites a return to the implicit counter-argument: Auschwitz as a site of industrialized genocide simply does not allow for play. Certainly the screened scenes of Kamp erase every example of resistance, every "moment of reprieve," to use Primo Levi's phrase. Life is not beautiful. The performance is not an exhaustive survey of the whole dystopian city: there is scarcely a hint of the camp's strata or of the marginally less deprived circumstances of those who, like Levi, had skills that kept them alive. Kamp shows us "Kanada," that section of the camp where a group of more privileged women sorted seized possessions, but one can have no inkling that Kitty Hart, a survivor of this group, performed a three-act play while there (as she later recalled). Kamp instead focuses, entirely justifiably, on the brutally simple narrative invoked by "Auschwitz": a city designed to kill people. The screened scenes, that is, are unremitting in their focus on the horror of the place. And one of the surprising effects of the puppets is that the audience experiences this horror in part vicariously. A new group of prisoners arrives by train: we watch the performers lift flats from inside the cars, each containing the figures of many prisoners. The camera then scans the group. They are disconcertingly well-dressed: the men in suits and ties, the women in dresses. Their clothing will be the last marker of sexual difference in the piece. What is most striking in this sequence is the way their eyes, simply holes gouged into their faces, register their encounter with the place they could not have imagined. The mobile camera surveys their still bodies, and the audience sees an accumulation of terror. (In the Times, Patricia Cohen rightly compares these faces to "Munch-like howls.") Very often, the liveness of this "live animation film" belongs not to the stationary puppets themselves, but to the camera that surveys them. The tableaus of horror culminate in a survey of puppet corpses: one survivor of the gas chamber struggles to move, and collapses. Along with the intimations of serious play, there are also suggestions of horror movies: the audience watches giants terrorize minute prisoners with a camera. The hollow-eyed prisoners taking in the enormity of Auschwitz seem also to be seeing the hulking puppeteers who make them move. Susanne Lammers, in a Dutch review, comments on "the impassiveness that characterises the three performers' silent and determined efforts to bring the events to life": "This is alienating and sinister. In its efficiency it recalls the way in which a concentration camp was run." Such efficiency is especially clear when the three, with the care of a crack fire brigade, set up the hundreds of small figures for the roll call. Kamp, in a little under an hour, provides a theatrical abstract of Auschwitz. The effect of the piece doesn't lie in novelty of subject matter. On the contrary, it relies on the spectator's having some knowledge of what transpired there -- in complexly mediated ways, it repeats something known. There is no dialogue: a soundtrack provides the scenes' sonic complement. No narration provides captions for what we are seeing, as if to suggest that this is a fundamental experience that cannot be mastered in linguistic form. Kamp literalizes a metaphor: all agency lost, the victims of tyranny become puppets. The performers refuse even that ventriloquism that is the puppeteer's gift to the puppet. In refusing to speak for these figures, Hotel Modern confesses the limits of its powers to speak for or to mediate the experience of Auschwitz's victims. The most evident of these forms of damaged mediation is the camera, which produces stuttering scenes of terror. (A darkness around the edges of the screened images recalls the effect of a pinhole camera.) The most important form of mediation may, however, be the presence of the humans who orchestrate this performance of objects. Without the contrast between their ungainly presence, their dour playfulness, and the scenes they have staged, there would be no play. Benjamin's emphasis on play as a form of psychic mastery and on the transformation "of a shattering experience into habit" helps to describe the ambiguous power of Kamp. In relation to the Holocaust, there can be no question of mastery: this goes almost without saying. And yet, precisely in its combination of the awkwardly handmade and the elaborately choreographed, Kamp captures a need to repeat, to try to know what cannot fully be known. Through its forms of serious play, it reminds the audience of the necessity of repeatedly trying to know, and also of the inevitable failures of knowledge and of mastery alike.